Part of the mystery of Morris is that there is so little historical information about it. Some would like to believe that it is a surviving remnant of Druidic springtime rites. Others think that John of Gaunt or some crusaders brought it to England after the Moorish conquests. Alternatively, it bears some resemblance to a form of Italian court dance called the Moresca which dates from the 12th century. In short, if you ask a Morris dancer on the street about the history of Morris the reply is likely to be just about anything. 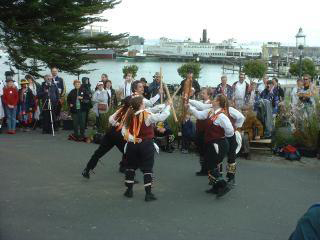 In the written record, some form of dance called Morris can be documented in England as far back as the 15th century. The earliest known reference is in a will from 1458 which mentions a "silver cup sculpted with morris dance.'' There are other wills which describe the disposition of other similar cups; some of these cups were in the possession of the Royal Family. So at its earliest known point Morris was already common enough to have spawned a knicknack industry. During the 16th century the annual acounting for several churches contain expenditures for the purchase of Morris bells and costumes, and also income from the rental of the same to neighboring parishes. Morris dance was performed before the courts of Henry VIII and Elizabeth I, and the tradition was described as "ancient'' by those courtiers. Shakespeare's play "Henry V" would have us believe that Whitsun Morris dances were sufficiently common that the French royalty knew of them. Morris, performed by a team of men and a team of women, was the central theme of one scene in a play, "The Two Noble Kinsmen," by Fletcher, which was viewed by Elizabeth I at her house on Drury Lane. Rhett Krause has uncovered evidence that Morris was performed on the North American continent in 1583. According to the account of Edward Haies, captain of the Golden Hinde, his crew performed Morris dances in what is now Canada for "the solace of our people, and allurement of the Savages.'' The manifests of other ships exploring America also indicate that Morris paraphernalia were on board. By the beginning of the 17th century some Puritans were denouncing dancing (and most other forms of festive expression). It is often supposed that the years of Puritan rule following the Civil War contributed to the demise of Morris in many communities, but if true this was likely due to the enforced whims of a few autocrats. Indeed, during the Protectorate only just after Charles I was executed, the first edition of the "English Dancing Master" appeared. This treatise on country dances was so popular with the new ruling class in London that another edition was needed within a year. When Charles II returned from exile he was greeted by numerous Morris dancers along his route from the coast to London. In 1679 Blount published a description of a springtime festival, the Lamb Ale, in Kirtlington. One small part of this festival was a Morris dance by men and another by women. The character of this celebration seems to typify that of most Cotswold Morris for the next 200 years. Most of the celebrations were tied to May 1st or to Whitsunday. The celebration in each village had its own local peculiarities, processions, and characters. Some of the villages shared a common element such as the Whit-hunt in the Wychwood Forest. Many Cotswold villages had their own distinctive style of Morris. This included peculiarities of the music, the steps, and the figures. There were various "ales" to which the dancers from many villages would come and perform. By the last half of the 19th century, however, many of these local and regional celebrations ceased. The reasons for this loss of local tradition are topics of debate, as the written history of the end of Cotswold Morris is not much better than the history of its origin. In some villages where the annual Morris had ceased, it was revived after a few years by one of the original team members or a descendant. One such village was Headington, near Oxford. On Boxing Day of 1899 the Headington Morris Men decided to dance. This midwinter dancing was quite out of the usual season for Cotswold Morris, however it proved to be the key to the revival and popularization of Morris, for the dancers stopped to perform a set directly in front of the house where Cecil Sharp was spending the holiday. Sharp was one of numerous scholars who had noted that other European countries seemed to have a much richer folk tradition than England. The discovery of Morris and the associated traditions led to several decades of active searching for other villages where Morris either had been or still was practiced. From those villages where Morris persisted, collecting Morris dances was a relatively easy task of watching the performance. However the collectors also searched until they found survivors of the defunct teams. When they were located for interviews, some of these dancers and musicians were over 80 years old or in wheelchairs. Still they whistled or fiddled the music, and they danced or demonstrated by hopping their fingers. This was adequate to permit the preservation of Cotswold Morris. Though the 19th century teams had mostly been composed of men, Mary Neal brought the dancers and dances to her Esperance Club for Women. These women greatly accelerated the revival of Morris. Before the first World War started, both Neal and Sharp had published books on Morris. The information in these books, the following decades of research published in various folk journals, and the original notes of the collectors serve as the source material for present day Morris. 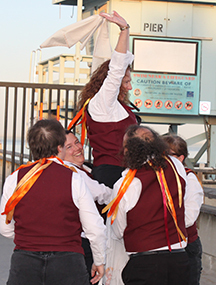 Though there are historical precedents for dancing on May Day and for individual teams dancing at dawn, the first recorded incident of Morris dancing at dawn on May Day is from 1923. It was in that year that the Oxford Morris Men decided to join the May Day Dawn festivities at Magdalen College. The Morris revival reached the US starting about 1915 with the creation of the organization now known as the Country Dance and Song Society. Morris has been taught at CDSS activities since the beginning. Aside from a few teams localized at individual camps and colleges there were no Morris teams in the US until the 1960s. In 1969 Roger Cartwright started the Village Morris Men in New York City. 1973 saw several notable events. The Binghampton Morris Men came into existence. Mitch Diamond reports that 1973 was also the first May Day with Morris dancing in Cambridge Massachussetts. He also reports that Roger Cartwright started what would be known the next year as the New Cambridge Morris Men. Ring O' Bells, the first US women's team, started in 1974. In 1974 and 1975 Roger Cartwright and the New Cambridge Morris Men were at larger and larger May Day dawn gatherings in Cambridge. The explosion of Morris teams across the rest of the US dates from roughly this era, and dancing at May Dawn has come to typify US Morris teams.